Cooper-Young is more than a neighborhood. It is a community, or "a unified body of individuals," as the Mirrian-Webster's Dictionary defines it. Residents of the neighbhorhood consider The First Congregational United Church of Christ at 1000 S. Cooper St. to be the center of its unity. "More than food and clothing, I find peace here; and peace covers it all," said church member Eddie Alexander. The church shares its space with 29 organizations, which reach out to the entire community. "When I refuse to share my light, I'm refusing to live fully. I'm not healing anyone, even myself. I am not mending creation," said First Congressional member Brad Stone about why the church helps everyone, not just members. The missions housed within First Congo help people physically, spiritually, mentally and fiscally. If one were seeking nourishment, the answer would be in the Loaves and Fishes Closet. This is opened from 2 to 3 p.m. every Tuesday and Thursday. It offers food and clothing to those in need. Upon arrival at the Loaves and Fishes Closet, one can expect to be welcomed with open arms. "I love you, but not as much as God does," said Roger or "Rico" Rodriguez, a homeless person and also a church member, as he patted the back of a complete stranger. 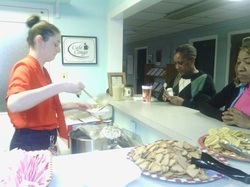 On Feb. 20, Rodriguez and a group of about 10 people held hands as Associate Pastor Sonia Louden Walker lead prayer before attendees lined up for a hot bowl of potato soup. After eating in the Congo Café, those in need had the opportunity to pick out donated clothing. Another mission working out of the Congo Church is The Global Goods Fair Trade Store. Its goal is to support farmers and artisans. Goods can be bought at fairtradememphis.org. For those in need of a support group or counseling, there are several different options. Narcotics Anonymous and Gamblers Anonymous support those battling forms of addiction. The Depression Bipolar Support Alliance of Memphis meets every Tuesday. It provides moral support and tools for recovery. Aside from organizations that help those battling illness, spiritual and mental guidance can be found in The Pilgrim Center: Counseling for Living and Learning. Though it is located in a church, it has no religious affiliation. Those who use the services offered by the church volunteer their time. "I don't have a lot of money, but I help any way that I can. Most of us do," said Tony, a homeless member and regular at Loaves and Fishes. Others said the church is all about community. "I come for the people. They really care about me and my younger sisters. We all take care of each other," said Josiah Houston, 12. For a full list of services offered by the church, click here.